Shopping for Marvel Creative Toys? 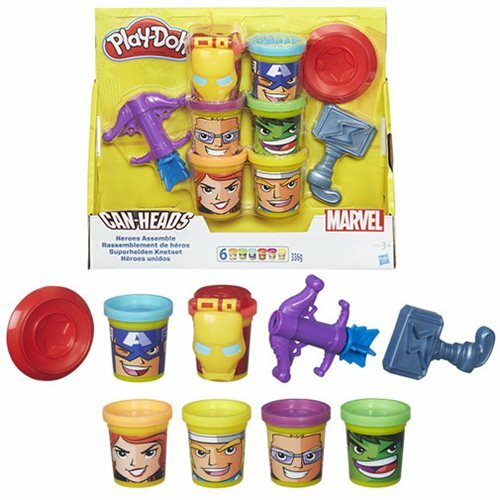 Take the lid off imagination and create smash 'n bash adventures with Marvel Heroes Assemble Play-Doh with Can-Heads! Now iconic Play-Doh cans are ready to face epic creative battles again and again. Assemble everyone's favorite crew of Marvel Super-Heroes for some colorful action, including Iron Man, The Hulk, Black Widow, and more! Smash all enemies and stamp lightning bolts with Thor's hammer. The Iron Man faceplate stamps an Avengers badge and snaps onto the Tony Stark can (or other cans who want to try it out). Squeeze silly arrows from Hawkeye's bow! Stamp a star and Captain America's iconic letter A with his shield, or use it as a rolling cutter to slice through crime. All it takes for hilariously heroic adventures is a little imagination! Ages 3 and up.